�����Try compiling a list of great song-writers of our time. Not those who became famous for a brief time and then disappeared, but those who have consistently turned out great song after song, perhaps for a couple of decades or more. You might include Lennon & McCartney, Bob Dylan, Paul Simon, Ray Davies, and you can doubtless add many others. My list would include an unknown, R. Stevie Moore, who has made recordings since 1967, and is still in his "prime." So why isn't is name a household word throughout the world, as it ought to be? Now the story can be told. �����In the mid-Seventies, R. Stevie had already made over a dozen home demo tapes, and attempted to get signed to a major record label. He got no offers. Reasons given included, "the music's too weird," but I think the real reason has to do with a reluctance of the music industry, at that time, to bring in any new artists. They had the idea that all the Sixties and very early Seventies bands, i.e. The Rolling Stones, The Who, etc., could continue being the entire music scene for a long time to come, even though some of these groups were starting to get stale; certainly there were many new artists who deserved as much exposure, and didn't get it. The punk & new wave movements were ike a dam bursting, and they required the formation of many new, independent record labels. �����It's not just the quantity of music that's special; one must also consider the reason behind it. Quite simply, there is no record industry behind R. Stevie Moore telling him, "You can't do this, you can't do that." As in, it's not permitted to put out 150 different tapes, and keep them all available at once via a tiny mail order service. You can't do that much music without also getting into live tours, T.V. stardom, or at least music videos (he refuses to make one, even though many of his lyrics have strong suggestions for visuals). You can't do silly things like long tape experiments between pop songs, or taping silly sound effects, or monologues, or telephone conversations, or take ther people's records and sing over the top of them! (And with different lyrics, too!) But then, this is more than just music, it also serves as a continuous audio diary of Stevie's life, even though he'll probably deny it. And if this description sounds like there's a lot of fooling around going on within these recordings, rest assured that the main bulk of each tape is a collection of some of the greatest original pop & rock music of today. �����A double album of greatest hits, mostly from his early tapes. A definite "must-have" to find out his best known songs, with no attempt to avoid the wilder ideas. It only lacks the non-musical between-song monologues and foolishness... actually, some of it's still there, but other songs have been edited a bit, which is understandable considering that he wanted to squeeze in as many songs as possible. �����This one is more like a typical RSM cassette, even though it's a compilation. Some of the songs are more experimental, and there's a live track, a radio marathon "commercial," and lots more. A favourite is "Feisty Schoolmarm," which is a crazy psychedelic non-song. For further irrelevance, the side change occurs in the middle of a song, probably the exact half-way point of the album. �����This is the second time RSM has done sessions in a "proper" recording studio. The other was "Clack!" (described further on), which was done in an 8 track studio; this one was done with 16 tracks. It's all a straight-forward presentation of his best songs, with almost no "fooling around" at all. It may be aimed at the record industry and radio establishments thathave been avoiding him thus far, and so is not a typical R. Stevie Moore album. But don't let that stop you from buying it. �����This has enough of his best known songs to sound like a compilation, but it's mostly original material. The song-writing is of overwhelming quality, yet RSM takes time out for cover versions of other songs ("Do It Again", "Suspicion", etc. ), plus experiments, rude sound effects, and monologues. �����Intended as a vinyl release, but never released as such. The title refers to the sound a scratched record makes. It begins with a parody/tribute of "Chantilly Lace", an updated near-punk version. Then comes an imitation of Public Image Ltd. on "Conflict Of Interest", then a hokey Nashville song. Next, Stevie sheds his masks and presents his original style in an excellent track called "The Flavor Is Mine." And the tape goes on and on, without ever hitting one less-than-fantastic song! �����Two out of print vinyl releases, re-issued on tape. The first album, "Phonography", is fairly subtle until, half way through, it hits a multi-dubbed electric guitar cover version of the Andy Griffith Show theme. Then all hell breaks loose, and continues through the second album, "Delicate Tension", a true classic by any definition. Both of these albums are comprised of the best material recorded up to their time of release, and they demonstrate how Stevie has provided an amazingly wide spectrum of various musics, right from the start of his involvement with recording. For this re-issue, a few extra tracks have been thrown in to fill the tape. �����One of several live tapes; lots of fun, but hear the original versions of these selections first. This is necessary, to understand the moments when RSM parodies his own songs! �����One of my favorite recent releases. This one may be harder to get into, because of the 15 minute long rambling acoustic guitar & vocal blues song near the beginning. It's just Stevie's way of pointing out that there's nobody to stop him from filling up his tapes any way he wants! But later, there are 2 reworked versions of George Harrison's "Within You, Without You", that are completely different from the original, yet of equal fascination. �����Two other tracks, "Shakin' In The Sixties" and "Colliding Circles", are early versions of songs from the "Glad Music" album. In both cases, each version has something that doesn't appear in the other version: a bit of extra lyric, a different arrangement or style. RSM enthusiasts are encouraged to hear both albums. �����There are so many more albums worth mentioning, but it's best if you et his desriptive catalogue, and discover them for yourself. I just got tape no. 167, which is probably his latest as I write this, and probably not by the time you read this. �����"Back In Time" is a pleasant folk song about dissatisfaction with pop music of this decade, a yearning for the past, and the ethics of nostalgia. These concerns recur here and there throughout the album. "I Love You Too Much To Bother You" is a flippant declaration of lost love, with a catchy rhythmic melody and tricky lyrics. "Blue Hawaii Ball" turns out to be a free-for-all under-rehearsed jam session with friends, done strictly for laughs, demonstrating mad genius on the part of everyone involved. "I Will Want To Die" is a partially serious tear-jerker about facing the future, with lyrics that dare to ask, "Will it become customary for me to hide my actual year of birth?" Steve has sad predictions for his career: "I'll be an ancient blues man down / In some obscure small Texas town / With an audience of nine / I Will Want to Die." This is accompanied by lamenting harmonies and mournful nostalgic finger-snapping. �����"Bricks In My Pillow" is an excellent but cryptic blues song with vocals and acoustic guitar nearly drowned out by imitation 78 RPM surface noise. "Rain," a barely recognizable rendition of the Beatles tune, is one of the three Beatles songs found here. Next comes my favourite song on the tape, "Hobbies Galore," another gentle acoustic piece about Steve's life work. This one is relatively optimistic, yet there are still subtle self put-downs in the lyrics. "Good Morning, Marry Me" uses poetry, choirs and tape loops; a very uplifting application. "Goodbye" is a simple rock piece, not outstanding on the surface, but the performance is bursting with enthusiasm. �����"Crime Wave" begins with a heavy-handed beat box drum machine joined shortly by gentle acoustic guitar. Steve is blending contrasts from different decades, musically and lyrically. The song is about the deterioration of urban society, and includes a Harlem rap in the middle! "Am I Ugly" starts off as a 'cool' instrumental track that's rather fantastic and flashy, except once again the lyrics deliberately contrast the music to shatter the mood with expressions of self-doubt. It's actually quite hilarious. �����Then there's "Friendzy," a straight-forward display of virtuoso acoustic guitar; "A Thing About Thing" that is avant-garde anarchy beyond parody; a goofy country and western song called "Blues For Cathy Taylor" about Steve's love life (once again funny and touching at the same time); and "Please Let Me Sleep," a poetic monologue performed in a silly voice. �����Not to be missed; my top choice of the year. �����I've already hailed R. Stevie Moore as the greatest and most prolific of Unknown Pop-stars, but due to his enormous output I haven't got to covering his more avant-garde releases. Yes, Stevie has made a few electronic music and sound experiemnt tapes. These, and other odd items, will now be examined. �����"All Twenty Minutes" with Victor Lovera (RSMCC NT-04): QNE Volume 1. (Review of first 20 minutes): Like Nurse With Wound as interpreted by the Residents, or possibly vice versa. Creative and well-executed tape collage. Some found sound, but much more pseudo found sound as in fake interviews, announcements, etc. Also some rather thoughtful bits of gentle music fading in here and there, rather than the comparatively noisy music others would throw into a collage. Clever, reasonably accessible, ahead of its time (1973). �����(Review of the next 20 minutes): Now this is getting downright difficult. Random scraps of rehearsals, dialogue, experiments that go nowhere, rough edits unending, warm-ups between songs, bad takes, unfinished bits, in other words the stuff that anyone else would throw away. The monster from the cutting room floor. Can you stand to play it to the end? While straight? How about more than once? �����(Review of the last 20 minutes): More noises. A return to TV dialogue and such. I just don't know. A tape for brave or foolish listeners. �����"Curiously Enough" (RSMCC NJ-73): Original Motion Picture Sound Track it says; yeah sure. Performed by The R. Stevie Moore Orchestra; ditto. More like improvisations on a borrowed Roland and drum box. A deliberate attempt to do something casual and off-the-cuff, it nonetheless comes out as another example of brilliance. A few pieces (all are untitled) have since re-appeared as backing tracks for songs. A wild mixture of competent performance and joyful foolin' around. It shouldn't have worked, but it did. Another winner. �����"Stevie Does The Beatles / Apologies To Mr. Gottlieb" (RSMCC NT-14): Side 1 is instrumental versions of songs originating from the Fab Four, with particular emphasis on their middle years circa "Revolver." Most feature flattering recreations of the backing tracks with crunching lead guitar replacing the vocal track. A pleasant exception, almost an interlude to the rest, is "And I Love Her" played as an acoustic guitar solo with an improvised arrangement. Numerous Beatle tunes with vocals have appeared on Steve's other tapes, so perhaps this collection was done mainly for recording and playing practice. Essential, none the less. Side 2 I didn't get at all. It's kind of a rock opera about a rising rock star's battle with the music industry, but oddly enough it doesn't appear to be autobiographical. �����"Skeletons" with Jim Price (RSMCC NJ-137): More casual and/or hard driving instrumentals; unrelenting percussion via JP won't let the feet keep still. C-60. 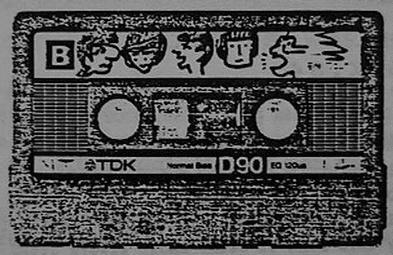 �����"Grease" (RSMCC NT-02): A bunch of teenagers doing silly things into tape recorders. Nostalgic, hilarious, stupid, unforgivable, unforgettable. Some music, but it's not a high point. In fact, nothing is. Anyway, I liked it. �����"Phoney" (RSMCC NT-123): A bunch teenagers doing silly things into telephones and capturing it on tape. Crank calls go out to old people with bad hearing, police stations, brothels, suicide crisis centers, Bible and prayer readers, etc. Thoroughly disgusting and inexcusable. Anyway, I liked it. �����"Mere Static / Planet 81" (RSMCC NT-05): QNE Volume 2 (QNE = Quintessential Noise Experientalism). 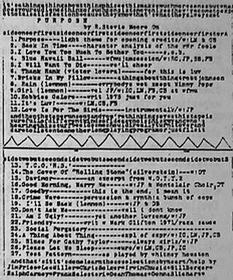 A bit like "All Twenty Minutes," but this time Steve has thoughtfully provided 36 track titles for side 1 to help provide orientation. This side is apparently based on a radio fund-raising marathon to eliminate static (i.e. to keep the station on the air), but more than anything it's an excuse to do another tape collage. �����Side 2 is less random by comparison; a Firesign Theater inspired radio play about the religion and philosophy of Thigh-ensology (or something like that). Presented in a semi-structured format, it includes more of those genuine crank phone calls. This is more accessible than the other three sides of QNE, and I'm sure the old Captain would have approved. Another recommended item. �����"Man Of The Year" (RSMCC NJ-158): I know what you're thinking; this guy R. Stevie Moore sure does a lot of odd side projects, but are there any that you'll want to listen to again and again? Why of course! Here's a collection of 38 songs, or at least most of them are songs, many of which were recorded with a portable monophonic tape recorder, and acoustic guitar, and vocal. Despite the low demo approach these tracks present Steve at his most sincere attitude, doing music that is very personal to him, but we can listen in with full appreciation. And after all, you won't find truly sentimental love songs with titles like 'Take Off My Clothes' on the pop charts, that's for sure. Another track called 'A Little Gust O' Wind' is a silly song with a nasty twist, in the style of Kevin Coyne. But most memorable is Steve's monologue on the Challenger 10 disaster, recorded on the day it happened, while sitting in front of the TV watching the endless replays. In retrospect his comments on the affair are right on the mark as he expresses doubts and concerns over whether the news coverage is telling the whole story. One of his most essential recordings. �����"Jim Price Sings" (RSMCC NJ-82): Though not really an RSM tape, it deserves mention here for its over-the-edge lunacy. Includes unaccompanied singing (I think it can be called that), radio announcements, tape cut-ups, and even some songs. A hoot. Described in R. Stevie Moore's catalogue as a C-60 and priced accordingly, it is in fact a double cassette, C-90 plus C-60. �����Except where indicated, these tapes are C-90s and cost $8 each including postage (1986 dollars).